Orecchiette Pasta Fill 1 Created with Sketch. 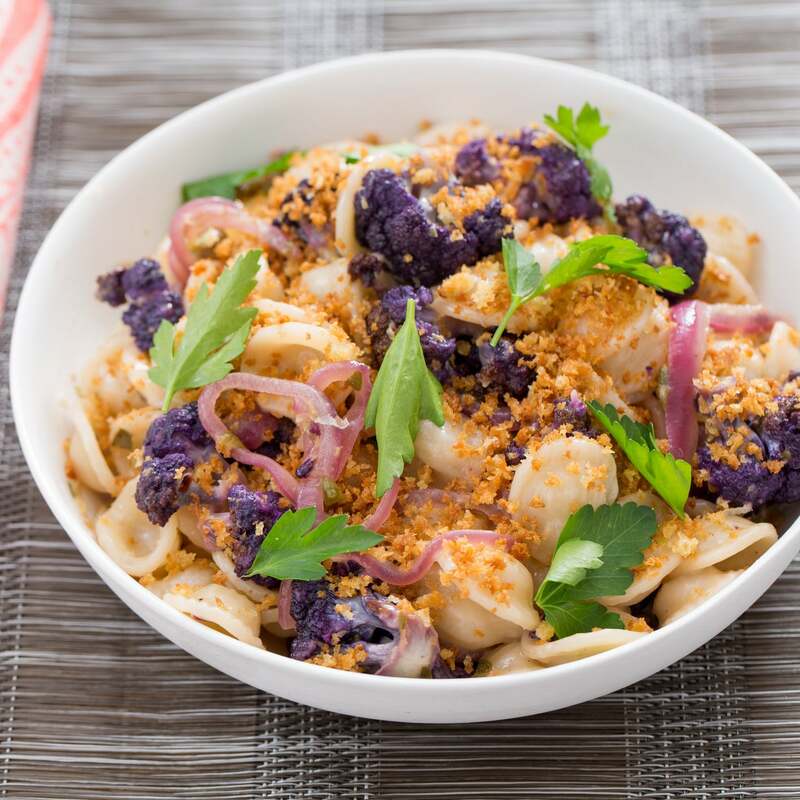 Orecchiette pasta hails from Puglia in southern Italy. Its name comes from its unique shape, which some say resembles little ears. 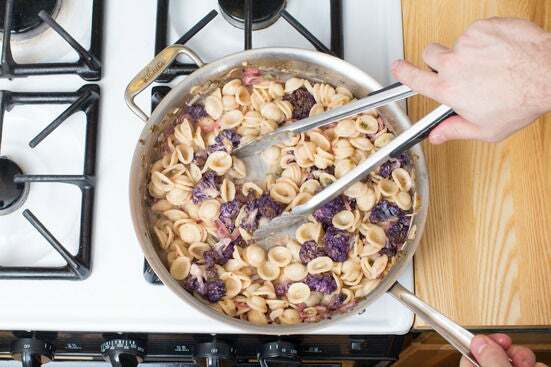 In this delicious fall recipe, orecchiette’s little dimples pick up the rich, buttery sauce. 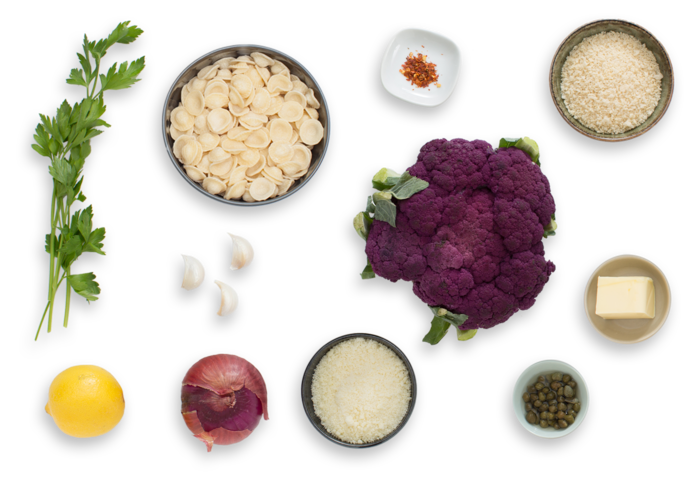 Its chewy, hearty texture is a wonderful pairing for roasted heirloom cauliflower. Here, purple cauliflower is pictured, but depending on what’s freshest, you may receive orange or green varieties. They’re all in season right now—and they’re all delicious! Preheat the oven to 450°F. Wash and dry the fresh produce. Heat a medium pot of salted water to boiling on high. Peel the garlic; thinly slice 2 cloves. Mince the remaining clove; smash with the side of your knife unti it resembles a paste. Using a peeler, remove the yellow rind of the lemon, avoiding the white pith; mince the rind to get 2 teaspoons of zest (or use a zester). Quarter the lemon; remove the seeds. 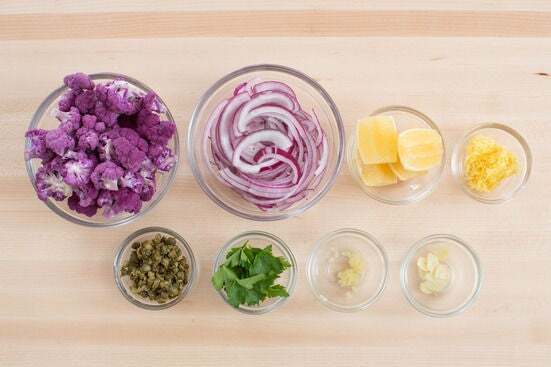 Remove and discard the core of the cauliflower; cut the head into small florets. 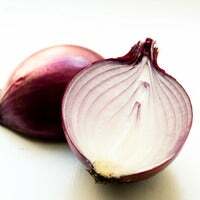 Peel and thinly slice the onion. Pick the parsley leaves off the stems; discard the stems. Roughly chop the capers. 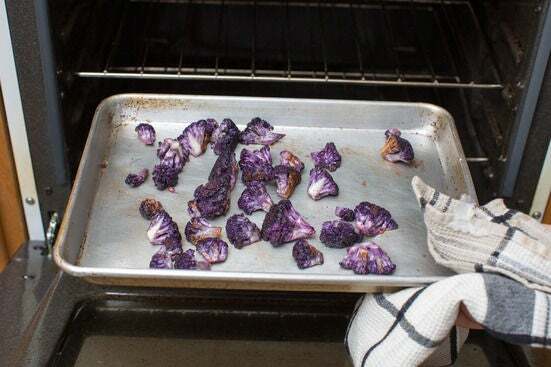 Place the cauliflower florets on a sheet pan. Drizzle with olive oil and season with salt and pepper; toss to thoroughly coat. Arrange in a single, even layer and roast, stirring halfway through, 18 to 20 minutes, or until browned. While the cauliflower roasts, in a large pan, heat 2 teaspoons of olive oil on medium until hot. Add the garlic paste; cook, stirring frequently, 30 seconds to 1 minute, or until fragrant. Add the breadcrumbs; season with salt and pepper. Cook, stirring frequently, 2 to 4 minutes, or until golden brown. Transfer to a small bowl and set aside. Wipe out the pan. 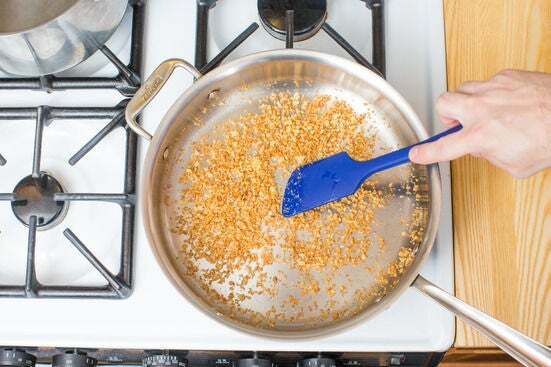 While the cauliflower continues to roast, in the same pan used to make the garlic breadcrumbs, heat 2 teaspoons of olive oil on medium until hot. 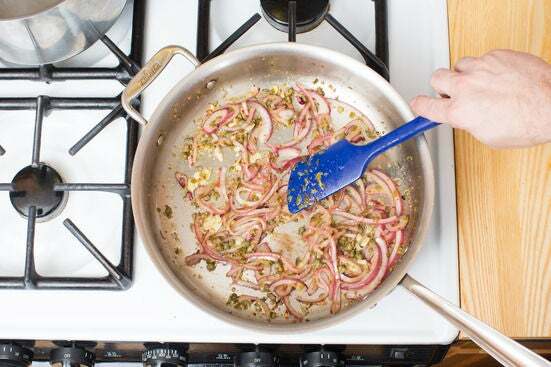 Add the onion, sliced garlic, capers and as much of the crushed pepper flakes as you’d like, depending on how spicy you’d like the dish to be; season with salt and pepper. 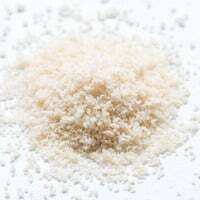 Cook, stirring frequently, 2 to 4 minutes, or until softened and fragrant. Remove from heat and set aside. 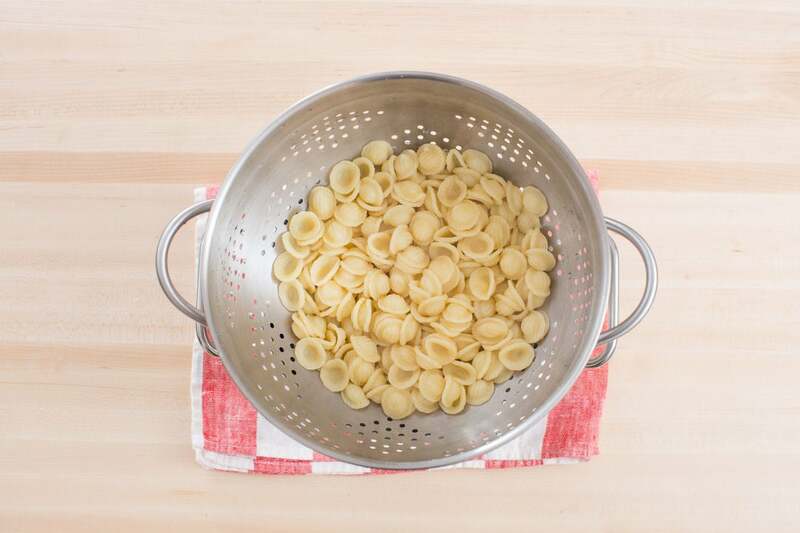 Add the orecchiette pasta to the pot of boiling water. Cook 9 to 11 minutes, or until just shy of al dente. Reserve 1 cup of the pasta water; drain the pasta thoroughly. To the pan of aromatics, add the drained pasta, roasted cauliflower, lemon zest, the juice of 2 lemon wedges, butter, Pecorino cheese and ½ cup of the reserved pasta water. Cook on medium, stirring frequently, 2 to 3 minutes or until the pasta is coated in the sauce and heated through. (If the sauce seems too dry, gradually add the remaining reserved pasta water until it has reached your desired consistency.) Remove from heat; season with salt and pepper to taste. Divide between 2 dishes. Garnish with the parsley, garlic breadcrumbs and remaining lemon wedges. Enjoy!